Are you looking for ways to make a professional Marketing budget and need the perfect Marketing budget template? 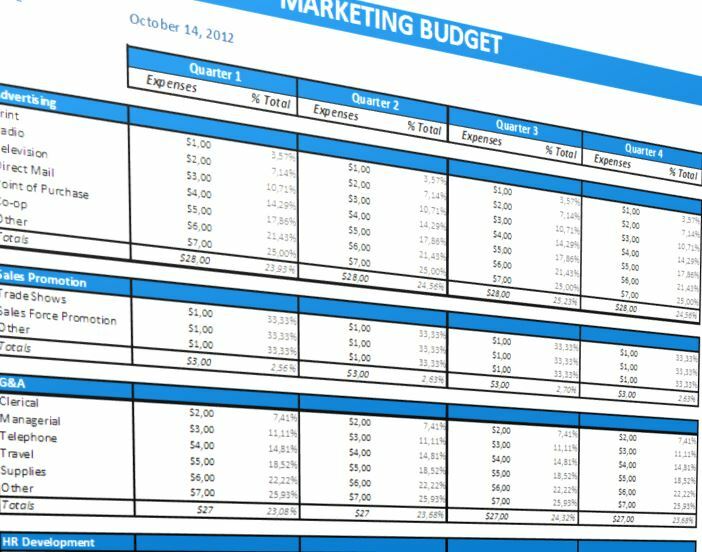 Download this Marketing Budget Planning Spreadsheet template and save yourself time and efforts to invent it yourself! Your time is valuable! We provide a well-thought-of Marketing Budget Excel Spreadsheet that helps you to underpin your marketing strategy and budget. It has been used in many startups and fortune-500 companies. The formulas are programmed and will automatically update the totals for each section and give an overview of the total of all budget aspects. This Marketing Budget is an Excel template, and the formulas are already in place. You only have to pick the right topics and add the correct 'value' and 'comments', which enables you to finish your professional Marketing Budget in minutes! Our marketing templates are helping you to reach the next level of success in your education, work, and business! Download this Marketing Budget Planning template and after downloading you can change and customize every detail and appearance and finish it in minutes.